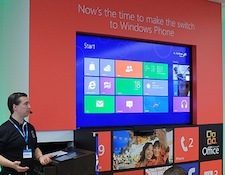 More information is starting to surface about Microsoft’s new operating system Windows 8. The company has unveiled the four editions that it plans to roll out to consumers. Last month, the company introduced the beta version, or Consumer Preview, of Windows 8. The highly anticipated release features a full touch interface, something Microsoft has attempted to integrate for some time. The major differences between the four editions — Windows 8, Windows 8 Pro, Windows Enterprise, and Windows RT — are based on the features each will contain. Windows 8, the most standard edition, features everything most consumers will need and will be the default recommendation, according to Microsoft. Tech enthusiasts and business professionals might be interested in Windows 8 Pro, which includes everything from the standard version plus encryption, virtual hard drive support, PC management, and domain connectivity. It also features several exclusive features, such as BitLocker and hosting Remote Desktops. Windows 8 Enterprise includes all the features of Windows 8 Pro, as well as tools for PC management, advanced security, virtualization, and deployment. The final version, Windows RT, will be installed on PCs and Android tablets that contain ARM-based processors — which will help these systems have a better battery life. Also included is a free version of Microsoft Office and device encryption. If you’re thinking of upgrading, you can see a full list of the differences between Windows 8 editions on the Windows Team Blog. Microsoft has yet to provide details about pricing or availability.